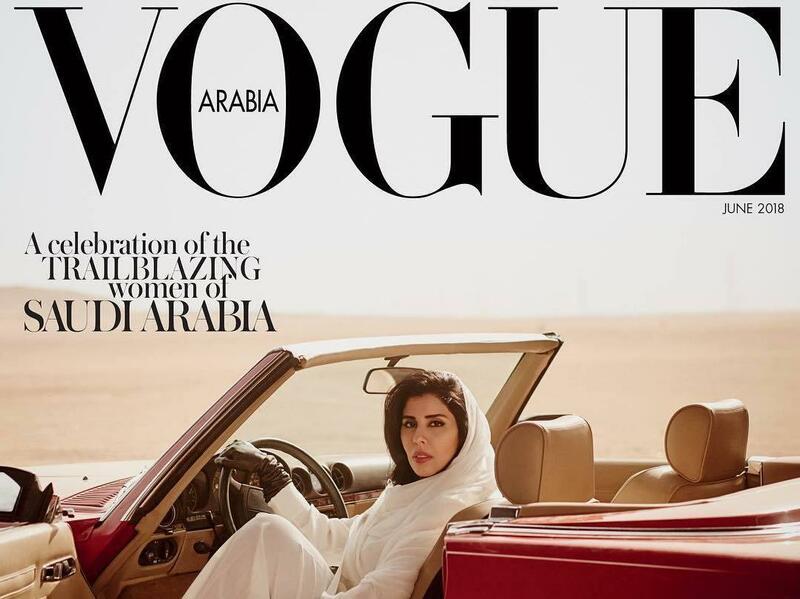 Vogue Arabia's June cover stirred controversy by featuring Princess Hayfa bint Abdullah Al Saud in a car, while activists who fought to lift the ban on female drivers in Saudi Arabia remain in custody. The June cover of Vogue Arabia featuring a Saudi princess behind the wheel of a convertible is facing backlash. The photo was intended to celebrate the trailblazing women of Saudi Arabia ahead of the lifting of a ban on women driving, on June 24. But the royal family has been accused of jailing female rights activists who for years fought for the right to drive. It is the first Vogue edition dedicated to the conservative country. Editor-in-Chief Manuel Arnaut said the magazine "celebrates the exciting and progressive changes transforming the Kingdom" and that "embodying this new era of female empowerment is [her royal highness] Princess Hayfa bint Abdullah Al Saud." He added that the photo shoot, in "the dancing sands of the desert of Dhahban" outside Jiddah, was "of great meaning for the Arab world." But some people saw the cover as an affront to Saudi women's rights activists who were recently arrested. At least 11 activists have been detained since mid-May, amounting to "a large-scale crackdown on women's rights activists and other supporters," according to the Human Rights Watch. Some of the activists remain in custody. That casts doubt on the kingdom's commitment to women's rights, Sarah Leah Whitson, Middle East director at Human Rights Watch, said in a statement. "The crown prince, who has styled himself as a reformer with Western allies and investors, should be thanking the activists for their contributions to the Saudi women's rights movement." "The choice of a Saudi princess for Vogue Arabia's cover is completely tone-deaf," Husain Abdulla, executive director of Americans for Democracy & Human Rights in Bahrain, told NPR. "It obscures the monarchy's long-standing violations of women's rights and freedoms in Saudi Arabia, and steals credit from the trailblazing women who have campaigned ceaselessly since the 1990s for equal rights — and who the government just locked up." Fatima Saied, president of the Muslim Women's Organization of Central Florida, told NPR that the cover sends an "incomplete" message. "To ignore the plight of the women activists being detained at this moment, and to ignore all of the rights that are still being infringed upon by the Saudi regime, paints an inaccurate picture." Some critics took to Twitter and superimposed images of jailed activists on the princess's face. In the article, the princess shares memories of her father, the late King Abdullah. She says, "In our country, there are some conservatives who fear change. For many, it's all they have known. Personally, I support these changes with great enthusiasm." The issue includes coverage of other prominent Saudi women, such as activist Manal al-Sharif, who filmed herself driving and was later arrested. Al-Sharif tweeted a picture of the magazine cover on Wednesday, reminding the public to remember the women activists who were rounded up by authorities last month. "@VogueArabia June issue is dedicated to Saudi Women.. I haven't got my issue yet, but so happy that my country women are being celebrated yet let's not forget the true heroes @azizayousef @Saudiwoman @LoujainHathloul." Arnaut explained to The New York Times his thinking behind the magazine's cover. "Informing and initiating healthy debates around meaningful topics are a priority for us, and we therefore decided to emphasize this with an iconic and powerful image that is completely fulfilling its purpose: bring focus to the region and to the role of women in Saudi society." The magazine has not responded to NPR's request for comment. Vogue Arabia launched online in October 2016, followed by a print magazine in March 2017. It receives more than 1.8 million page views per month, according to its publisher Conde Nast. The fashion and lifestyle magazine has come under fire for its Middle East coverage in the past. In 2011, Vogue Arabia published "A Rose In The Desert," a profile of Asma Assad. She is the wife of Syrian President Bashar Assad, who has been accused of human rights violations and using chemical weapons on civilians. The article praised the couple as "a 'wildly democratic' family-focused couple who vacation in Europe, foster Christianity, are at ease with American celebrities, made theirs the 'safest country in the Middle East,' and want to give Syria a 'brand essence,' " The Atlantic reported. The Hill reported that a U.S. lobbying firm received $5,000 per month by the Syrian government to assist with the Syrian first lady's interview and photo shoot. The article has since been removed from Vogue's website.